15 courageous Cyclenixers stood up to the challenge on this most amazing spring day in the middle of January. We all pitched up at the entrance to Kfar Uriya all ready to take on the promised hills but first the debate about where not to turn like last time. The route was quite simple, Burma Road and Derech Ha'psalim. These paths, which are now mostly paved, are full of our history, our heritage and our future. 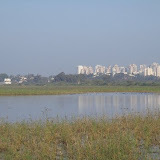 Looking out to the horizon, beyond the hills and through the forests are villages. On the other side every so on was a park with benches and jungle gyms. Who would have guessed that this was once just a mountain with a small path that was used wisely to overcome our enemies. An occasional memorial monument to remember the many who gave their lives so that we can enjoy riding these paths. Uri brought cake and asked us to stop at a park so that we can take a few minutes to remember his father in law Zvi, who originally fought for the Hungarian army in the Second World War and then came to Israel and joined the mule brigade. Whoever came this morning was not expecting an easy ride and we got what we wanted but we got so much more as well. We got to breath the amazing fresh air, feel the warm spring day. We got to witness this most amazing scenery, stop and smell the flowers. We got to get to spend great quality time with one another. And we definitely got to conquer our own personal challenges on today's ride. The weather was superb, the vibe was awesome, the terrain could not have been any better, it was a combination that made a perfect ride! We did just over 24 km's with 540 meters elevation gain and had an unusual lunch stop at "Steakiyat Asa". To our dearest Ingride we wish a happy birthday! Seven of us, "The Magnificient Seven", Ilan, Yvette, Barbara, Frances, Megan, Merrill and yours truly, met at our usual spot at 8am (we got in an extra 30 minutes sleep) and set out on a route that we have traversed many times, via Rishpon, up the hill to the fields of statues, through Shefayim, passed the Sharon Coast nature reserve, onto Gaash, around the golf course and then onto Batzra with a final breakfast stop at Landwers where we were joined by Jules. The weather was perfect and the trail not too muddy after the resent rains. What was different about today's ride was that after an absence of a good few months Megan was back in the saddle with us and I was riding a new (for me) bike. For a few years now David has been trying to persuade me to dispose of my bike and upgrade to a carbon framed and I have always resisted, with a, "there's nothing wrong with my bike"! Well, Michal is obviously a better salesman, because, a few days ago she called to tell me she'd found a "good deal" carbon bike that she was sure would suit me. 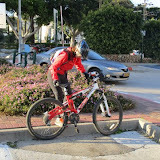 So, on Thursday, she accompanied me up North to the Krayot just North of Haifa to view the bike and I brought the bike home with me (A Specialised Stumpjumper) and today I "tried it out". My world of cycling has changed! What a difference. Thank you Michal, and to David, I'm sorry I didn't listen to you before!!!!! I cannot believe the difference! We covered about 30 kms and everyone enjoyed the ride(especially me), the company and the breakfast at the end of the ride. I have learned to only trust Google when it comes to the weather forecast. It is extremely accurate even a week before. The entire week I have been saying like a mantra "there will be no rain" partially aggravated with people who go according to other weather reports and partially convincing myself that I will ride regardless! A dozen courageous Cyclenixers refused to let the weather be an issue! They geared up with rain coats, layers of clothing, long gloves etc. me on the other hand... "There will be no rain!!" With the confidence that it will get as warm as 18 degrees came as I always do (the grown up in me made sure that I have a long sleeve shirt in my bag just in case. We headed up Ahuza all the way to the park to discover that we had already lost a rider to a puncture. We continued towards Herzelia where David let Ted guide us in a new path to Ramat Hasharon all on pavements and inner roads all to avoid the mud. Passing the very fancy cemetery, on a bit muddy terrain with a few puddles we got to Cinema City. Sadly we did not stop to catch a movie. All with our bikes in the air we crossed on the bridge over road no. 2 in a nice single line. John who was like a proud peacock modelling his new haute couture yellow wind breaker brought traffic to a halt when he attempted to take a picture of the oncoming traffic. Luckily the driver only slowed down and he didn't cause an accident. We continued to Herzelia all the way to the cliff that is always a pain. Whether it's the strong winds, the long sandy or muddy stretch it always seems to drain me of my energy. The view though is always amazing. Via the marina, along the beach, and climbing up to Ramat Yam street. This was the moment where we realized that the most important question has not yet been asked or answered! Where are we going to have our breakfast stop?!?! After a quick vote, Aroma Raanana was the choice of the day. In a long straight path going up and up and up some more on Menachem Begin leading us to Yerushalayim and straight to Aroma at Lev Hapark. John refused to let me pay my share for our breakfast and confiscated my credit card. I joked about it and told Frances that my card was stolen till John returned it to me. We all had a great breakfast stop, enjoyed the quality time together and each continued on their way. On my way home I discovered that my credit card is missing and had to cancel it and order another one. So I guess the joke was on me after all... we were just shy of 28 km's and guess what... IT DIDNT RAIN!!!! well we didn't really try last week since the weather brought the management to cancel the ride. In retrospect it seems like it was a smart move since the terrain was still a bit muddy after an entire week of sun. Not too far into trying to cross over again and again we had a small casualty. Yochi was off her bike and injured her arm, I accompanied her to the nearest petrol station for her husband to come and fetch her. We all wish her a speedy recovery and hope to see her soon! We crossed over road no.4 and finally succeeded in getting into the fields of Geulei Teman. We rode through the tall grass all wet from the dew and built a new single. I call it the Cyclenix single. Stuart was trying to convince us to try and make crop circles and leave the Cyclenix logo for all alien believers to come and appreciate. We finally made it to Nahal Alexander!! Dodging the people who were enjoying the great outing weather, we rode happily along all the way down to the beach. We had a great nice stop and photo opportunity, enjoyed the amazing view, fresh air and company. On our bikes again we rode alongside the coast. Going up the cliff, constantly pedalling through the sandy sand. We all dropped our gears and gave it our best and I think almost all made it through the very long patch of sand. the majority of the riders all went on to enjoy a nice breakfast stop at Aroma in Rupin. About 15 of us set out with two new people to enjoy a crisp winter's day. Well early on the newbies decided we weren't their cup of tea... and deserted. Their loss! We had a lovely ride, covering around 28 km with a bit of everything: good views, a bit of sand, water, mud and of course a hill or two. No winter ride would be complete without a naartjie break (tangerines or clementinos to those not familiar with the South African lingo...). And of course we need the action of a puncture (Meir) and a fall (Barbara). Since I never really know where I am... we were on familiar routes... some of them backwards.... but since all roads lead to coffee, we ended up at Arcaffe where Anna joined us. 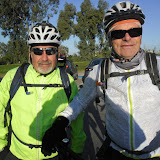 Thanks to David for a lovely ride and all the others that added to the discussion of "Which way should we go"....!! 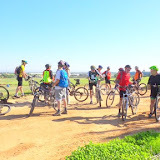 Twelve riders showed up at the Ramat Gan Stadium and we made our way into Park Leumi and on to the Tyelet along the beachfront. Riding through the park amongst the early morning joggers and walkers in the cold morning air is always very pleasant. From there we rode through the Tel Aviv Port and then along the Beachfront. The new cycle paths along the coast certainly make for much safer riding (for the cyclists and the pedestrians!). Eventually we reached the port of Jaffa, but, instead of going on to Bat Yam we doubled back into the Susanne Dellal and Neve Tzedek neighborhoods. The old buildings and narrow streets were quaint and quiet and riding through the Carmel Shuk's empty streets was certainly vastly different from the hustle and bustle during the week. Our "breakfast" stop was at Max Brenner on Rothschild Boulevard. Then it was back to the cars via Rothschild and Ibn Gvirol streets and the Hayarkon Park which was now teeming with pedestrians, other cyclists and joggers, out enjoying the cold air and bright sunshine. Another very pleasant 27 km ride (in cool weather for a change) was now part of Cyclenix archives. For the first time, in quite some time I thought that maybe I should just sleep in. This is usually a sign that winter is here but even though it is the end of November winter seems to be light years away. With no excuse, I got out of bed and rushed to our meeting spot. 7:30 am, 20 of us gathered up for such a lovely ride. Merrill and Sydelle didn't even make it out of the parking lot and needed to stop to fill up air breaking the record for fastest malfunction ever! Needless to say, they caught up with us very fast. We rode out of Ra'anana heading north to Batzra and Bnei Zion through the blooming citrus orchards continuing towards Tel Yizhak. The first half of the ride had a few up hills and the sandy sand that our area has been blessed with. Surprisingly, the sand this time had a bit more of a closer to the sea kind of feeling to it. It wasn't dry but just a bit damp and had been turned over to give us just a bit more of a challenge. The up hills were familiar but came one after the other, not leaving us to much time to get over the previous one and catch our breath.The biggest challenge of today was the "big climb" Merrill did it first and was standing at the top yelling her lungs out to encourage us all to do it. One after the other, the majority of us gave it our best shot and the most succeeded. After 16 km's Merrill, Sydelle and Uri took a shorter route home while the rest of us continued on our way. The ride from this point was very easy going and just pure fun! We continued east to Udim, the scenery was all very well known but there was something a bit different today. 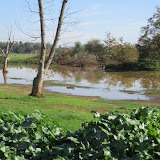 The weather couldn't have been more perfect, the fields were all bright green, trees were calling, nature at its finest! After a quick phone call to assure our place at Landwer, we headed back south through Yakum, Bnei Zion and Batzra all enjoying the great quality time together. I definitely tried to practice my new technical riding skills that I just recently learned, causing me almost to get dizzy going around in circles... also getting people to wonder if a girl can go left around the circle and not only right. We started off in two groups driving to the super mini -forest of Ben Shemen as some of us thought that interpretations of instructions are best left to Historians and decided we like the previous start location better, irrespective of interpretations! Some twenty of us made the effort on a beautiful morning with perfect weather. 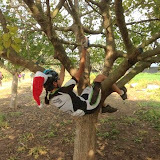 Among returning riders were Boaz,Yael and Ayelet , the latter driving our average age spiraling downwards. We departed working our way thru the throngs of riders. The price of long easy down-hills is quickly rewarded by challenging up-hills and today was no exception as we were soon wheezing to reach the summit of our now notorious "Lookout" (recovery room). Having no warm-up makes this climb ever more of a struggle. But up we made it in time to take a couple of breathers and take in the stunning panorama. John groaned but made it like all of us. Boy, does he love down-hills. We managed to repair Rafi's perplexing puncture and we are still inclined to blame my pump which I continue to deny vigorously. So up another hill and yet another and to make things worse we encountered hundreds of families out for the day walking on OUR trails. Such HutzpaHHHHHH!!! Another several up-hills with John's well deserved moans growing louder. But he did continue in heroic fashion and even reveled in the singles. Patching up Yael and Haim was in ER fashion. Too many nurses... Almost at the end several rebels played "don't follow the leader and were soon declared MIA . Several calls later we redirected them and regrouped but not before several other leaderless riders returned to the parking thinking the ride was over. We recovered some bodies and set off after David to Tel Fadid A view and snacks were in order followed by a charge back to the cars and home. Another ride fit for superlatives. Rock, grand, mystical, overcrowded, piney, cool, damp, breezy, stony, risky, single kids, strollers are just of the images and senses that come to mind. The perfect riding weather brought out 23 Cyclenixers today! Ahuva, was our new comer today, a warm welcome to her. At the beginning we were mainly on pavements and roads, I guess to keep away from the mud. We went up Ahuza towards Herzelia, going down Habrigada Hayehudit for a change instead of the dreadful up it on the way back. Quite early in the ride Frances left us due to a puncture that I guess could not be fixed. We continued into Kfar Shmaryahu climbing the bridge I was extremely excited when Yoavi succeeded in riding up the bridges today. I think it took me about half a year of cycling with the group to do that! We hit the off road trails just out of Kfar Shmaryahu and were heading north. It seemed that the heavy rains from a couple weeks ago were enough to flood quite a few cities in Israel but not sufficient to get rid of the sandy sand that this area is "blessed" with! The sand got some of us off our bikes walking. Yvette thought it was payback time for John and his mischief and tried to rub tires like he does so often. It resulted in her falling off her bike and john finding comfort of protection by our heavenly father. Or as he put it "she has been punished by the lord!" I only regret that I can't let you hear the evangelistic voice he used while saying that! I will just say I almost wet myself! Carrying on northwards heading to the bridge to cross over to Yakum, Ingride had a fall. It doesn't look like it was too bad but did need some TLC and a bandage for the bleeding. At this point John, Yoavi and I went to do the "jump" just after the petrol station as all the riders passed us by while we were having some fun. David took us the less muddy way and seemed to be a good call because we encountered very little mud on our path back to Raanana. We crossed under the train tracks to the Bnei Zion bypass road to carry on pedaling all the way to Landver. I felt that Yoavis pace was a bit too slow for the group at this point and had his mother come fetch us. Even though he wasn't happy about my "grown up" decision, we enjoyed the quality time on the side of the road. Since I declared him an official Cyclenix member today when he asked where we will be having breakfast, he obviously did not go home but came to Landver for the best part of the ride. 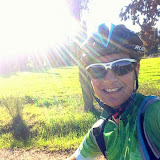 The ride was about 32 km's long and was another great home patch ride! The day started way too early with my alarm going off at 3:40 am! Funny thing is I never sleep well the evening before a ride like this so my clock didn't really wake me up. I could hear the rain pour the whole night long as was wondering "will it stop before my clock goes off?" I fetched Talia at 5:00 and we were on our way to the Sea of Galilee. We met up with Richard at the starting point and further down the road with David and Ingride, who stayed in Tiberius the night before. The weather was perfect just as predicted! 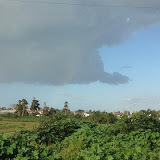 It did not rain and the sun was hiding behind the clouds so it wasn't hot either. 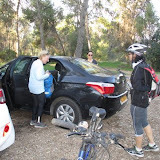 This was Talia's first time doing the Kineret ride so we got to yank her chains a bit about the distance and how many dreadful up hills to expect. As usual trustful David was the one to give her the correct answers. I was riding on a substitute bike, a specialized carbon bike. It is not my size and has not been fitted so the ride was physically painful to say the least. The longer version was that there were quite a few complaints about "lady parts"! Ingride sure got her laugh when watching me go down hills! The bike was almost going backwards it was so slow! While everyone was flying down I was peddling like a mad person trying to gain some speed. It was pointless since it really didn't make a difference but I guess I fulfilled my purpose by making everyone have a good laugh at me. This was the ride that David FIXED! At first it was a broken chain, for a random stranger, to whom Ingride volunteered his services. The second fix was a gear problem for a friend of mine who I ran in to (figuratively speaking) and the third was my $#1T bike that the front brake seemed to be a bit pressed. Surprisingly the ride seemed physically easier than the years before and none of us had any problems with the dreaded up hills, even after "warning" Talia about them. Richard and I took the challenge of speeding up to try and get them over with and waited at the finish line. 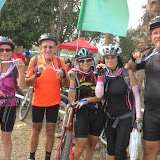 The cherry on top, at the end of the ride we got to meet Richards other half Vonda who was patiently waiting for us at the end. We then had a great breakfast at Greg cafe continuing the tradition from last year.